U.S. gold futures for August delivery rose 0.3 percent to $1,217.70 per ounce. 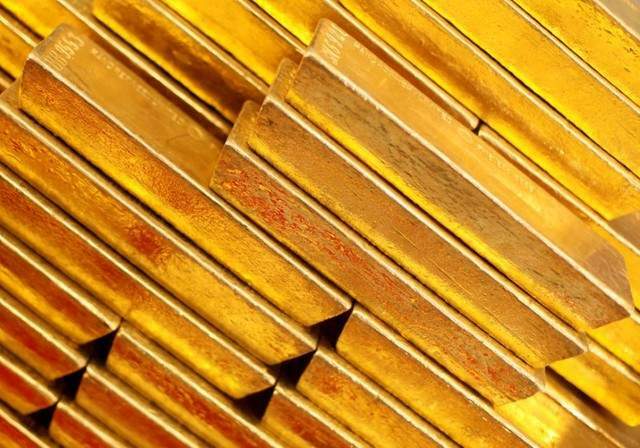 BENGALURU: Gold held steady on Wednesday as investors awaited testimony from U.S. Federal Reserve Chair Janet Yellen and central bank officials expressed caution about further interest rate hikes. "Gold's near-term direction will now be at the mercy of whether we get a hawkish Yellen on the Hill," said Jeffrey Halley, senior market analyst at OANDA. Yellen is set to give her semi-annual monetary policy testimony before Congress later on Wednesday and on Thursday, and investors will be parsing it for clues on when the Fed will start reducing its $4.5 trillion balance sheet, which would have the effect of tightening U.S. money supply. Meanwhile, two of her colleagues cited low wage growth and muted inflation as reasons for caution on further interest rate increases. Any pause in U.S. interest rate increases would be beneficial for gold as investors seek returns in other assets. While dollar-denominated commodities typically rise when the greenback declines, reflecting the intrinsic value of the commodity. Spot gold rose 0.1 percent to $1,218.46 per ounce at 0719 GMT. "I think we have hit the bottom for the short-term period and we are trying to go back to the $1,230 level over the next one to two months," said Yuichi Ikemizu, Tokyo branch manager at ICBC Standard Bank, adding that the weaker dollar was supporting bullion. The dollar edged down to 14-month lows against the euro in Asian trading on Wednesday as investors, already wary ahead of Yellen's testimony, digested emails released by President Donald Trump's eldest son suggesting he welcomed Russia's help in last year's election campaign. Spot gold still targets a range between $1,225 and $1,231 per ounce, as suggested by its wave pattern and a Fibonacci projection analysis, according to Reuters technical analyst, Wang Tao. "We continue to expect (gold) prices to recover towards the end of the year, as expectations for the Fed hiking cycle in 2018 to 2019 are scaled back, U.S. Treasury yields peak at lower levels, the Fed balance-sheet adjustment is well telegraphed and gradual, and India's seasonal demand materializes in September." said Standard Chartered in a note. "We maintain the view that the outlook for prices appears fragile in the near term." Among other precious metals, silver rose 0.4 percent to $15.84 per ounce. Palladium gained 0.4 percent to $853.25 per ounce and platinum edged up 0.1 percent to $902.00 per ounce.